You’d be forgiven for not knowing, or at least not knowing how to pronounce, Pete Buttigieg’s last name (it’s boot-uh-judge). His political experience to date includes two terms as mayor of South Bend, Indiana, and … well, that’s pretty much it. But on Wednesday Buttigieg became the second mayor to throw his hat in the 2020 Democratic presidential primary ring, and he might not be the last. Buttigieg’s age — he’s 37 now, and would be the youngest U.S. president ever if elected — and Midwestern background could help him stand out against a quickly crowding field of aspirants. But it’s also possible that Buttigieg, who wasn’t even included in a recent Politico/Morning Consult poll of 20 potential candidates, won’t be able to get on voters’ radars or build a base of support. On paper, Buttigieg is impressive. The son of an immigrant father from Malta, Buttigieg graduated from Harvard, earned a Rhodes Scholarship, and worked as a consultant at McKinsey before moving back home to Indiana at age 29 to become the mayor of South Bend, making him the youngest mayor of a city with more than 100,000 people. While still serving his first term, Buttigieg took a seven-month leave of office to serve with the Naval Reserve in Afghanistan in 2015. Less than a year later, Buttigieg came out as gay. Buttigieg’s sexuality didn’t stop South Bend voters from re-electing him to a second term with more than 80 percent of the vote. All that success didn’t go unnoticed. In a 2016 New Yorker interview, Barack Obama name-dropped Buttigieg as a potential leading light for the party. And the New York Times (“The First Gay President?”) and Washington Post (“Could Pete Buttigieg Become the First Millennial President?”) have both published profiles of Buttigieg in the last three years. Now, though, Buttigieg faces the challenge of turning that attention and potential into a campaign. How might that happen? When FiveThirtyEight editor-in-chief Nate Silver wrote about how Democratic longshots might build constituencies in 2020, he identified Millennials as Buttigieg’s core base. An enthusiasm for board games and Instagram-friendly rescue dog might be a start, but Buttigieg will need to make inroads with more than one group of voters to win. Where does he go after Millennials? One way forward might be to model his run after the 2016 bid by Bernie Sanders, a man who figured into the beginning of Buttigieg’s political career. When Buttigieg was 18, he won a prestigious award for an essay he had written about Sanders. He cited the then-Vermont congressman as an “outstanding and inspiring” example of integrity, writing that “… few others like him have the power to restore principle and leadership in Congress and to win back the faith of a voting public weary and wary of political opportunism.” At the awards ceremony, Sen. Ted Kennedy of Massachusetts offered Buttigieg a summer internship in his office, which helped kickstart Buttigieg’s career of public service. At this point, it’s hard to pinpoint where Buttigieg falls on an ideological spectrum, but we do know he’s pushed to raise minimum wages and supports Medicare for All. If the Sanders campaign were to fail to launch or falter, Buttigieg could find an opening. Just as Sanders ran on a platform focused on economic populism and working-class revival, Buttigieg can and will point to the role he played in leading South Bend’s Rust Belt transformation (you can already see the theme in his announcement video). South Bend lost thousands of jobs in 1963 when the the local Studebaker plant shut down. Between 1960 and 2012, when Buttigieg first took office, South Bend’s population had decreased by more than 30,000 people. During his first term, Buttigieg set out to change that, promising to raze or refurbish 1,000 vacant houses in 1,000 days. Sixty-two days before the deadline, Buttigieg announced that the goal had been met.1 He also oversaw a downtown revitalization project that some attributed to increased development in the area. The latest Census estimates show a slow and steady increase in South Bend’s population since 2013. How much of South Bend’s upswing should be credited to Buttigieg is a more complicated question, but he’ll certainly be able to point to the city’s new trajectory as he makes a pitch to voters. Moreover, as Nate pointed out, much of the Left (or at least the subset that attends Democratic Socialists of America conventions) is white and male, so someone like Buttigieg could package himself as a younger version of Sanders. Where Buttigieg goes next is a little trickier. There’s no reason to think he wouldn’t be acceptable to Party Loyalists. Along with support from Obama, former Obama campaign strategist David Axelrod has praised Buttigieg as having “limitless potential.” But if fellow-Midwesterners Amy Klobuchar or Sherrod Brown decide to run, Party Loyalists may support the more experienced politicians ahead of Buttigieg. And, of course, there’s former Vice President Joe Biden. 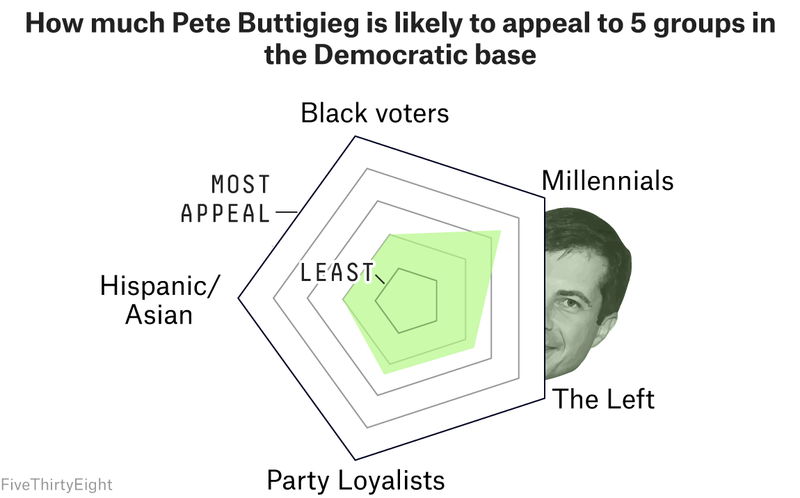 Buttigieg also has more experience appealing to minority communities than you might think. Forty-six percent of South Bend’s population in 2017 was non-white, according to Census estimates. OK, that number is more than 70 percent for Julian Castro (San Antonio), Eric Garcetti (Los Angeles) and Mitch Landrieu (New Orleans), but South Bend is more diverse than Minnesota or Massachusetts or Vermont. Beyond standing out in a crowded field and finding footholds with key Democratic constituencies, Buttigieg’s campaign also raises the question of whether Democrats are ready for an openly gay nominee. Among adults who identified as Democrats, 73 percent of respondents supported gay marriage, according to a 2017 Pew Research Center survey. Independents were close behind at 70 percent. But the same research found support for gay marriage at 51 percent among black adults, an important part of the Democratic coalition. Support was even lower among Republicans at 40 percent. So you can expect to see “electability” questions raised about Buttigieg. The last time Gallup tested Americans’ willingness to vote for a “generally well-qualified” gay or lesbian candidate for president — way back in 2015, unfortunately — 14 percent of Democrats and 24 percent of Americans overall said they would not be willing to vote for a such a candidate. Who would Americans NOT vote for in 2015? Those numbers are likely lower now, but while many voters will surely rally to the idea of the first openly gay president, it’d be naive to assume everyone will. Mayors also have a dismal record when it comes to presidential races (see Rudy Giuliani in 2008). Plus there’s a potentially large cohort of former municipal leaders in the 2020 candidate pool. “I fixed potholes; I can fix America’s potholes,” could become a common refrain and a hard way to distinguish oneself as a candidate. Given the odds against him, it’s possible a presidential bid is another way for Buttigieg to win by losing. Buttigieg’s first campaign was for state treasurer in 2010. He won 37.5 percent of the vote. But the experience raised his profile among Indiana Democrats and helped him lock up the South Bend mayoral race. His aborted run for Democratic National Committee chair served a similar function, generating media attention and signaling wider ambitions. Buttigieg may not get close to the nomination, but he’ll begin to hone a national message and help normalize the idea of an openly gay president. That alone makes him worth keeping an eye on.